# Remove the extra fat over the lamb abdominal membrane after washing it, and rest it in 1 cup warm water for 15 minutes. # Knead the mixture of ground meat, crushed red pepper, cumin, black pepper and salt, and divide into 6 portions, shape into oval patties. # Cut the membrane into 6 pieces after removing from the water. # Place 1 tomato slice on the middle of each membrane piece, 1 patty on it, cleaned long pepper near them. Wrap like a bundle. # Turn bundles upside-down. Place on the oven tray. Add 1 cup water on it. # Place the tray into the 392 F oven and cook for 45-50 minutes. # Place on the service plate, garnish with parsley and serve. Note: Peach Kebab is a Cypriot recipe. 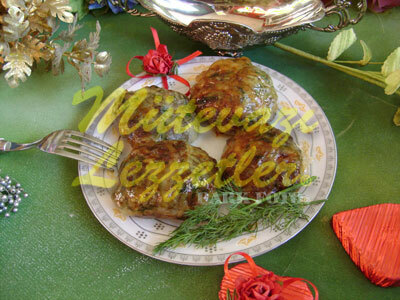 It is original name is "Chef Ali's Kebab", because of a misunderstanding it became "Seftali Kebab". They have so similar sounds. "Seftali" means "peach" in Turkish.